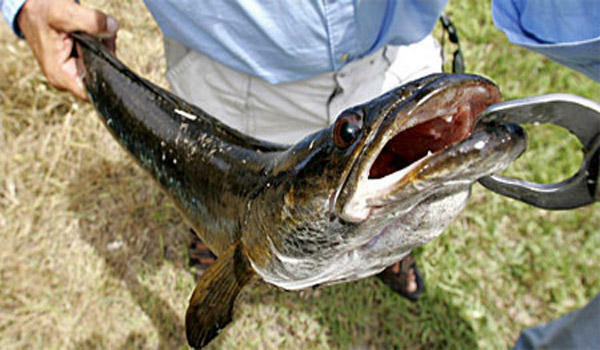 Snakehead fish reproduce like rabbits, but in water. Problem: With no known predators in Florida, snakehead fish go to town gobbling up frogs, fish, aquatic bird and small mammals. They also can survive on land for days at a time, migrating a quarter-mile or more. And they reproduce like fiends. A single female snakehead can release up to 150,000 eggs in just two years. Solution: Snakehead is common in Vietnamese and Burmese cooking, often pickled or braised in aromatic liquids. Julie Frans, chef at Essensia Restaurant in Miami Beach's The Palms Hotel, rubbed snakehead filets with African adobo spices and served it alongside millet, a couscous-like grain, and a mango-avocado topping. The dish was a hit at a recent charity event that featured invasive species. Frans found that giving snakehead a deep sear on both sides was the best preparation. "I tried grilling it, braising it, cooking it down with coconut curry spices," she said. "But it's a pretty hardy fish and is hard to overcook. Using the African blackening spices and searing it in a pan gives it a nice, spicy flavor that is mellowed out by the mango and avocado topping." Chef Julie Frans of Essensia prepares snakehead fish for her guests. 1. Mix together spices for adobo rub. Coat fish filets with rub. 2. In a separate bowl, mix together ingredients for mango-avocado salsa. 3. Sear fish on both sides in a hot, oiled skillet over medium-high heat until cooked through. Serve immediately, spooning mango-avocado salsa on top.